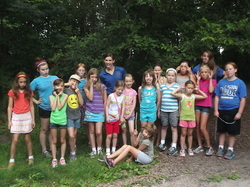 Browse through the classes offered through the Girl Scout Council and register for a class offered at the Nature Center. Registration for classes offered through the Girl Scout Council must be done through the Council. Troops may request a specific merit badge program and schedule a field trip. All available Merit Badge Programs are listed below. If there is a program not listed, please ask. We can create a custom scout program for your troop. We have also provided specialized programs for journeys and fun badges. Some examples include: Batty About Bats, Geology, World Cultures, and more. To request a Scout field trip use the form below. 2 hours: $15 per leader (includes Juliette Lowe history, hands on activities/training, nature activity book and more) This is a great workshop opportunity for a region to get together! Rosie Petal "Make the World a Better Place"
Clover Petal "Use Resources Wisely"